Talk about a conversation piece! All your friends will ask you where you bought it. This stunning leather-wrapped buffalo skull will showcase your style and become a stunning collectible in your home. Each bison skull is covered with garment-quality deerskin and adorned with feathers. The centerpiece features a natural stone or can be beaded to pick up your color scheme (add $85 for this option). A remarkable piece of art, your leather-covered buffalo skull will be a beautiful addition to your home. Designed by artist, Linda Hensley. To read our profile on Linda Hensley, click on Meet the Artists. Shown below is the peyote-stitched centerpiece. Please specify two bead colors in "comments section" of order form. Approximately 2 feet wide by 2 feet long. Ready for wall hanging. (Buffalo horns are removed for shipping, but can be easily reattached.) Shipping ranges from $75 to $125 for UPS Ground. Hang this stunning work of art above your fireplace. Complement Your Decor with Kokopelli Wallpaper Borders You've decorated your home with beautiful Southwestern furnishings and decor. 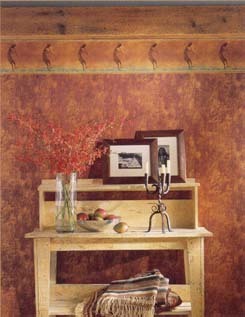 Now, accentuate this theme by adding Kokopelli wallpaper borders to your walls. Choose from Mystical Kokopelli shown below. Sorry--we have just been informed today: 3/24/04 that these wallpaper borders have been discontinued. We have 1 roll of Mystical Kokopelli. If you want it, order now. Wallpaper borders are pre-pasted for your convenience. While many of our customers simply soak and paste the wallpaper, one customer, Julie Hecmanczuk of California, has suggested that it's quicker and easier to paint the back of the border with wallpaper adhesive. Using this method, she was able to "border" the entire room in about thirty minutes with her husband's help. Each roll is 5 yards long. Three rolls will provide coverage for a 10 x 12 ft. room. Each Kokopelli Wallpaper Border is 10.25 inches high with a horizontal repeat of 20.5 inches. Thanks for your call today regarding returning my unused kokopelli wallpaper border. I'm attaching some photos of my newly painted kitchen. I truly love it and so do all my friends! 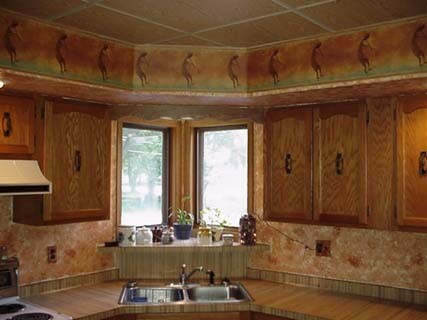 The walls are sponge-painted with Creamy Translucent base coat and Burnt Sienna. Thanks again for your service! Your products are outstanding!!! I just painted my walls copper and dusted bronze and the kokopelli wall border fit in like I had planned the color scheme around it! I also ordered the kokopelli wall decoration and it adds so much to the room with the border and color... I couldn't be more pleased. I can't wait for the hanging lamp I ordered. Now I am using this new border in a bathroom and carrying the colors from the border up and down. Should look great. Please be aware that opened packages of wallpaper borders cannot be accepted for return. Order your Kokopelli wallpaper borders today!